For years Sherline Products has supported a number of organizations that promote education and development in the engineering and machining fields by offering donations, discounts, and technical support. We here at Sherline feel it is important young people develop STEM skills (science, technology, engineering and mathematics) by promoting the hard skills of machining in addition to the soft skills of engineering. In other words, getting hands-on experience with manufacturing tools leads to better engineering. Sherline Products was a major sponsor of MakeMIT in 2016. MakeMIT promotes innovation that is geared towards those who are excited and passionate about designing and building. Over 250 students participated in a 15+ hour hardware hackathon on February 13, 2016. The top ten teams were invited to come back for a second weekend in order to refine their design. 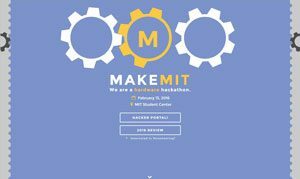 For more information on MakeMIT CLICK HERE. Our lead toolmaker, Pam Weiss, attended the conference and acted as a mentor to the participants. She aided the teams in designing their parts, and then manufactured their designs using a Sherline CNC mill. For those participants who were interested Pam showed them the machining process. She was also impaneled as a judge. Recently, Duro UAS, approached Sherline Products about sponsoring their Harbor AUV project in New York, NY. This project uses an autonomous underwater vehicle, or robot, to serve the NYC community as both a tool for important marine restoration efforts and a hands-on learning platform for local students. To read more about the Harbor AUV project, CLICK HERE. We were so impressed with the team at Duro UAS that we decided to donate one of our 2000-CNC mills for their project. This mill will be used by both high school and university students as well as some of the more experienced engineers at Duro, like Dr. Richard Sheryll, who will help teach everyone how to use the machine, the importance of proper measurements, the importance of taking care of your machines, and how to think about manufacturing when in the design phase. They will be making parts for the AUV such as small rings for frame support, half moons for bulkheads and small end caps for pressure vessels to name a few. The Stanford SSI is an ongoing program for Stanford undergraduates; the largest project-based group at Stanford University. SSI was founded in 2013 with the mission of giving future leaders of the space industry the hands-on experience and broader insight they need to realize the next era of space development. For example, their rockets team has just committed to competing in next years Intercollegiate Rocket Engineering Competition, which will require the use of a precision CNC machine. To help the Stanford SSI Sherline has donated a 2000-CNC mill with a 14″ base and a 6″ rigid column for their project. We felt the larger 2000 mill would do a better job of machining the larger parts their project requires. For more information on the Stanford Student Space Initiative CLICK HERE. Sherline tools and accessories are also used by a number of companies in a wide range of industries. These companies use our machines and tools for manufacturing, second operations, prototyping, and laser engraving to name a few. Check out the following list to see who is using Sherline Products in an industrial setting. Renishaw Inc. www.renishaw.com A global company with core skills in measurement, motion control, healthcare, spectroscopy and manufacturing. CryoWorks, Inc www.cryoworks.net CryoWorks provides a wide range of new and used products for the storage, distribution and transfer of cryogenic fluids. Source Production Equipment Co. www.spec150.com/products Our product line includes exposure devices, sources and accessories for performing radiography. Okay Industries www.okayind.com Manufactures components and subassemblies for OEMs in medical, automotive, defense/firearms, and industrial markets.